Publisher: Mas-Ivars Editores / Editiones Gaisa, Valencia, Spain. It is sometimes hard to distinguish Valencian and old Catalan editions, as even the map texts are may be identical. 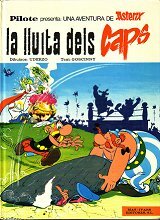 According to TJK, the title pages are identical to the Catalan edition by Mas-Ivars Editores, S.L., except that the line under the publisher's name reads "G. V. Marques del Turia, 64 - Valencia". There is "Astèrix" on the cover, but our hero is called "Asterix" without diacritics.